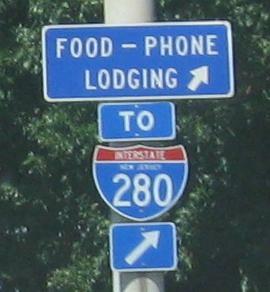 Mile 0 on the I-287 SB ramp to NJ 24. 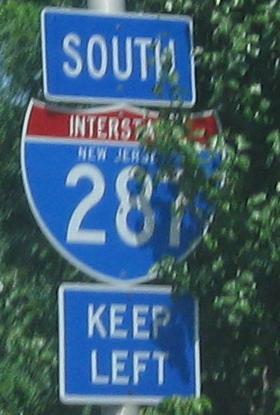 This is technically Ramp A; NJ 24 is now considered as beginning where Ramps A and D (from I-287 NB) merge. Surveying reference numbers on NJ 24 extend westward to about Ridgedale Avenue, through a bunch of trees owned by NJDOT. 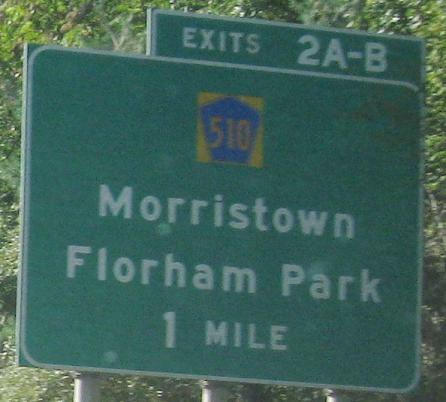 They were down-numbered to starting around 100 at the end of Ramp A, and used to be 500, which of course meant that there was a significant length of NJ 24 planned to the west (500 in reference numbers is one mile, but they reset every so often). This ramp was widened to two lanes several years ago. All the signs are button copy, right down to the gore. The gore signs have sadly since been replaced. Notice the small "j" in the third photo. 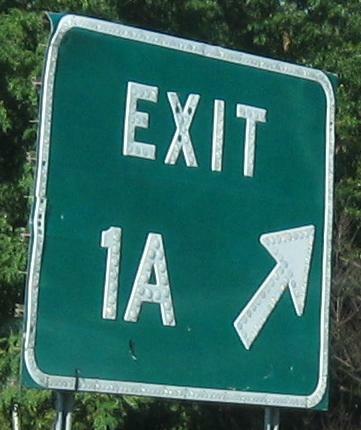 Exit 7 is almost a cloverleaf - except that NJ 124 goes from using NJ 24's frontage roads to the east to using NJ 24's old alignment to the west. Thus it's a five-branch clover, with some extra loops and a few movements (from 24) that require using more than one ramp. Those LGS's pretending to be BGS's are an annoying mini-plague at the interchange. Brantwood Drive probably was a crossover once, but was closed off by sound barriers. 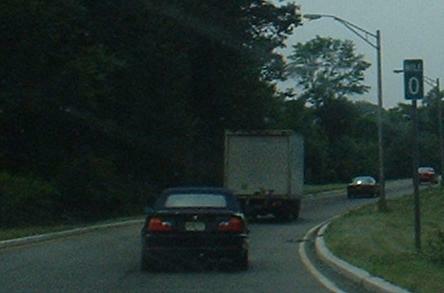 Now, the only way to cross NJ 24 is by traffic light, and there is no simple U-turn from NJ 124 one way to the other. The overpass remains because demolition is expensive, disruptive, and unnecessary, but not even pedestrians can use it. 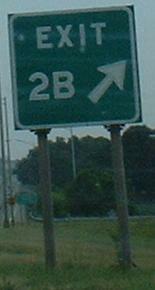 All still intact as of 2005 although similar EB and WB signs were replaced a couple of years ago. 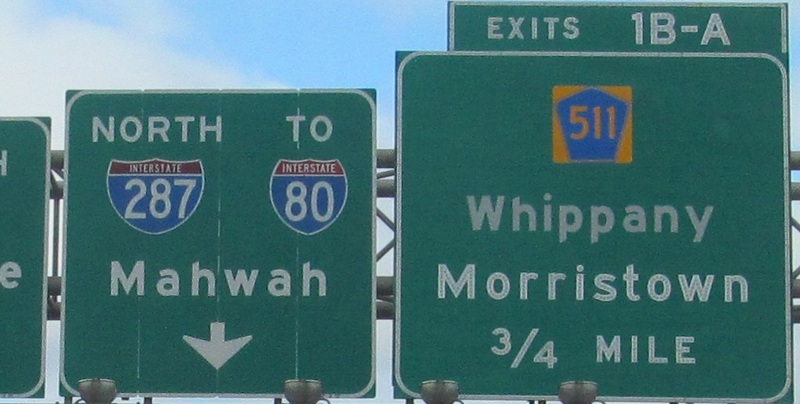 These are both directions of CR 527, and Exit 9A has good access to CR 512, but no signage for any of it. 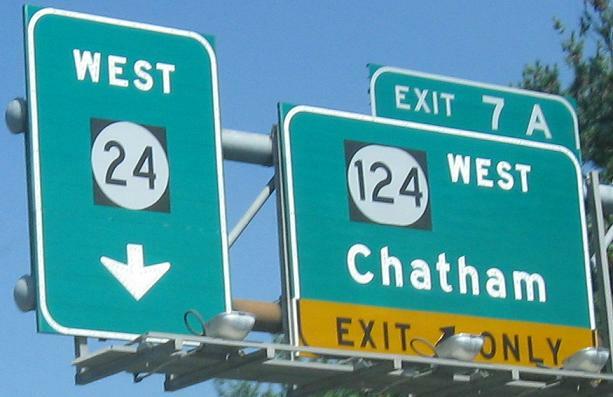 Before I-78 opened to the west, two lanes of 24 went Express and two went Local. Now, it's one and one, with a lot of striped-off pavement. 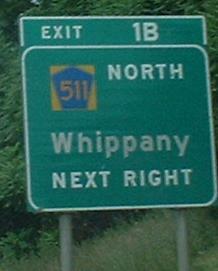 This shield most likely dates from the completion of I-78. NJ 24 would have entered I-78 less than a mile away from I-278 had the latter been completed westward; the FHWA rejected plans to designate 24 as I-278, though. 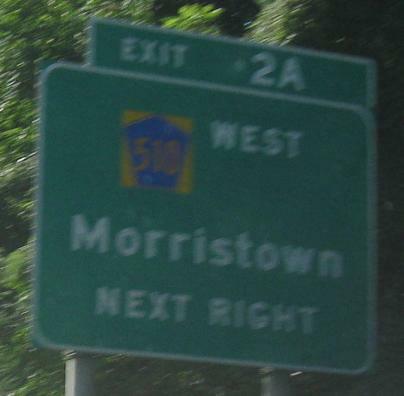 24 isn't even a completed freeway in its own right, though, since it was supposed to follow a northern route around Morristown, merging back in with old 24 (decommissioned once the freeway opened in 1992) west of the city. 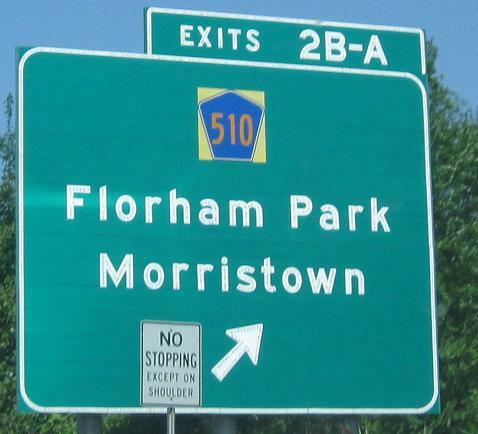 The problem arose when Mendham wasn't willing to let the freeway come through their town as was originally proposed - one by one, other towns north and west of Morristown voiced similar sentiments, and it's doubtful such an extension will ever happen now that the SB I-287 to EB 24 ramp is being widened to accomodate the full load of EB traffic. The first BGS was recently replaced from something looking more like the EB ones above, and yet it has a reflective button-copy exit tab somehow. 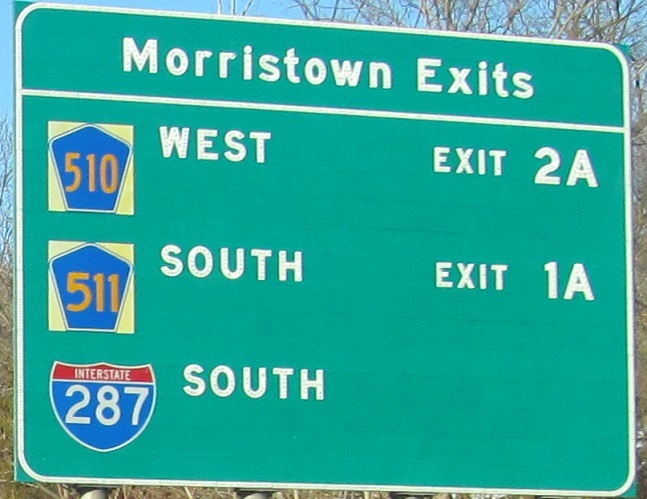 The right halves of the second and third photos are signage on NJ 124; follow the link at the bottom for another couple of photos on 124 at this interchange (including some numbered like they're still on 24). The Canoe Brook Road BGS in the second photo has yellow EXIT and ONLY corners on the bottom, vintage NJDOT. 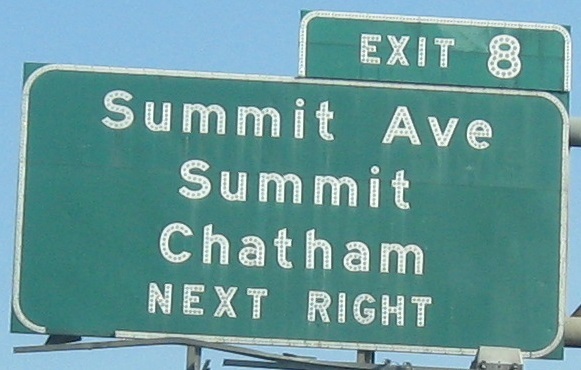 Triborough Road in Chatham does not exist. 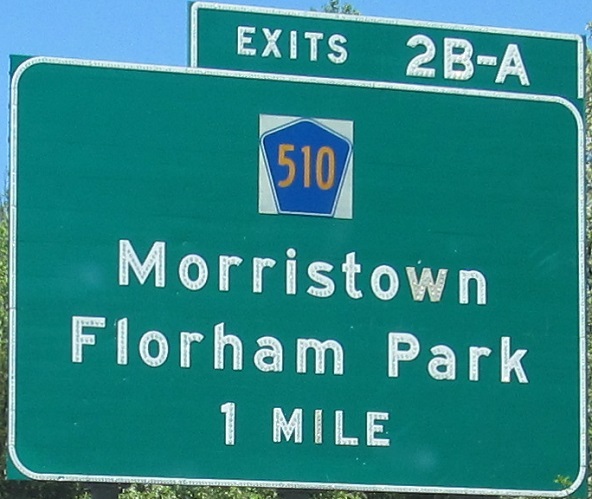 What does exist is an overpass on NJ 24 about where you would see Exit 5, each side having an identifying sign, as well as a few hundred feet of divided, unpaved roadway to either side, and eight fully graded cloverleaf ramps. The overpasses, ramps, and southern section of roadway are curbed, and the entire intersection is graded. 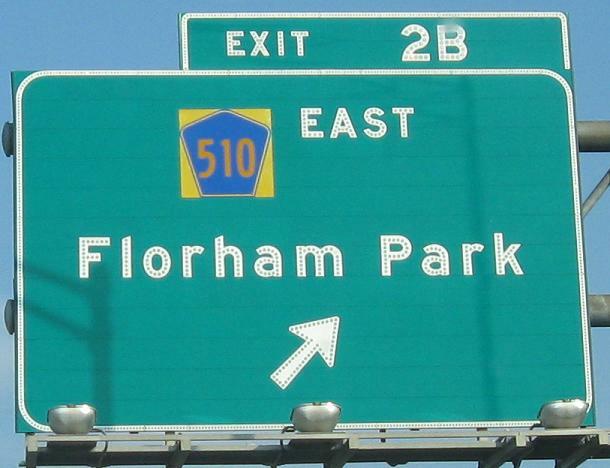 Triborough was intended to serve Chatham, Madison, and Livingston, but only the latter, in the form of Eisenhower Parkway, has been completed. 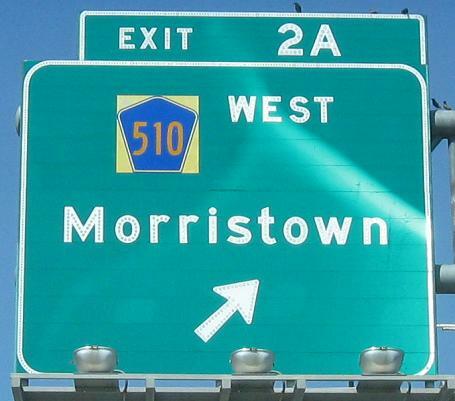 It was also intended to run north into Passaic Avenue, forming a truck-friendly corridor between 24, I-280, US 46, and I-80, but keeps getting killed by environmental concerns due to its proximity to the Passaic River for most of its length. 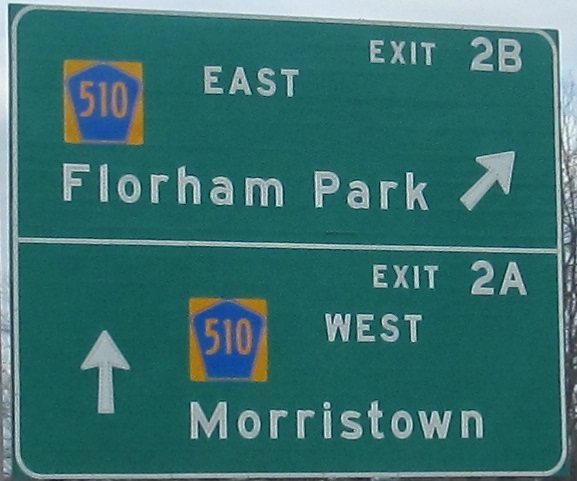 Until sometime in 2002, there was a blank BGS on 24 WB that originally had lettering for this exit - half of the portion of the 24 freeway that opened in 1992 had been paved and signed since the 1970's, and probably would have opened to the Triborough Road had that ever been completed. 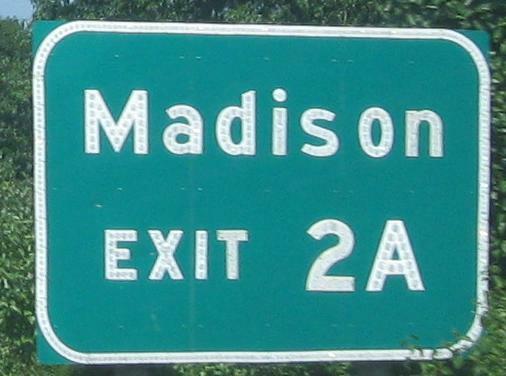 It read EXIT 12 on it, not EXIT 5, referring to the western unbuilt section I described above. The gantry remains overhead, though, and I did find the original sign. Apparently, instead of being killed, it was recycled and landed on NJ 3. For more photos, follow the Eisenhower Parkway link at the bottom of the page. 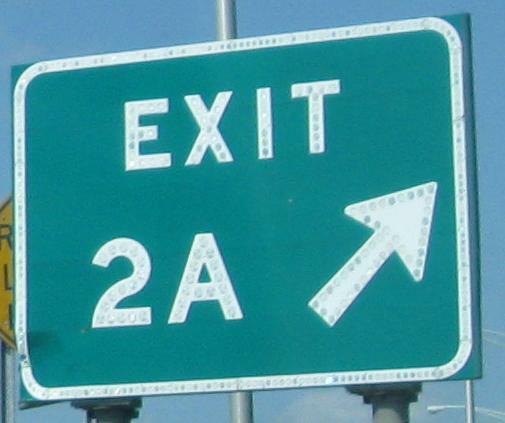 Again, all Exit 2 signs are button copy, as you can see. Notice that there are clearly two lanes of width striped as one lane in the last photo; until 2000, two lanes of NJ 24 went straight, and then merged together to flow into I-287 SB. 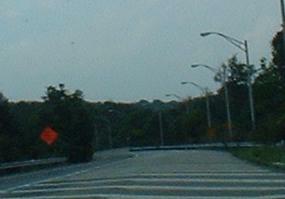 This was once intended to carry the mainline of NJ 24 westward, with a considerably different interchange configuration. Instead of looping sharply into I-287 SB, that connection would have been made by a left exit from the current WB-NB ramp and a long flyover. 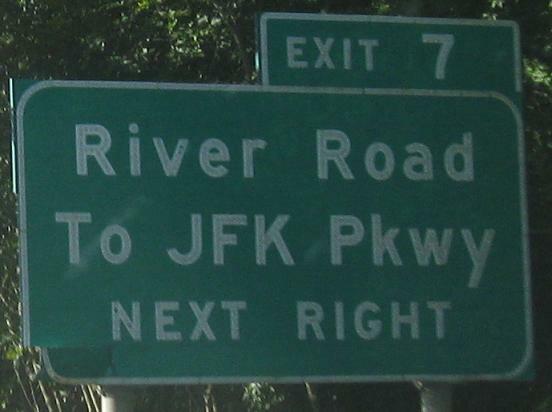 This would have gone straight through with a wider bridge, I-287 NB would have had a cloverleaf-type configuration (not as much traffic on NJ 24 to the west), and add a pair of right-hand ramps to complete the SB picture. 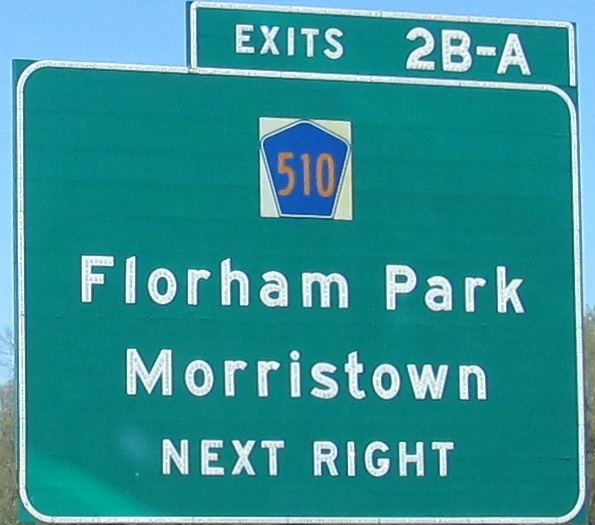 I'm not sure what used to be a destination instead of Whippany on the Exit 1B signs, but clearly reflective lettering has replaced button-copy.